Westward Ho! 2 vintage mold kits each with seated driver figure, rectangular display bases and no interior detail. 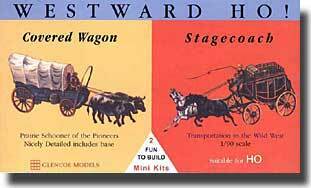 Stagecoach has 2-horse team and wagon comes with 2 oxen.